The 12″ drawers are found in either a three-drawer or six-drawer unit. The six-drawer unit only offers 1/3 more space than the three-drawer unit, but costs 50% more. In light of this, I recommend the three-drawer unit. The gas-spring lid opens to reveal another spacious compartment, so you can think of the three-drawer unit as having four storage compartments. If you’ve got a moderate budget, a lot of loose tools, and enough space for the larger footprint, you should take a look at the sweet 18″ deep drawer units. One of these five-drawer top boxes will theoretically store a few more tools than two three-drawer 12″ deep units. You can choose between a powdercoated black finish or, for a higher price, stainless steel. We can’t post all the prices, ’cause there are so many, but Lowe’s is selling the three-drawer, 12″ deep unit for $80 and the five-drawer, 18″ unit for $215. A final note about Lowe’s website: enter your zip code to see the lower prices. Don’t you guys usually bash on Kobalt stuff on your podcast? While I cannot speak for the other writers or podcasters, I can say that yes, I generally do not like Kobalt tools. However, certain Kobalt products definitely hold their own against other prosumer brands, are made in the USA, and carry a great warranty. By the way, does anyone know who manufacturers the chest type shown above? One of the great things about Kobalt’s line is that the top shelf is sturdy and spacious. I never liked the top of Craftsman’s chests – they’re held up by a somewhat flimsy support, and I don’t like the metal separation tabs. 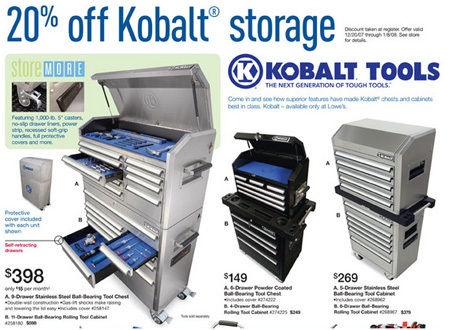 Bear in mind that I’m referring to Craftsman’s boxes that are in the same price range as the Kobalt boxes. Because I don’t like the top compartment of Craftsman’s chests, I’m currently using two intermediate units. Kobalt’s top is supported by two gas springs, which add maybe $20-$30 to the parts and production cost. This means that a 3 drawer chest really has 4 drawers worth of storage space. The Kobalt boxes also have great handles built into them. It’s little things like this that make a difference. Craftsman’s boxes are built to traditional designs. Their attempt to break out of the box – the AXS – has yet to see much success. When you purchase a Craftsman box (aside from the AXS), you have to purchase drawer liners separately or get some kitchen shelf liners and cut them yourself. Kobalt throws these in for free. Yes, that’s just a minor bonus, but it adds to their overall superiority. Even though I am generally neutral towards Kobalt products, I love their chest designs. After spending 20 minutes examining their chests for educational purposes, I was about to purchase an 18″ SS box before I had to remind myself that I don’t have the space for one. Aside from the Kobalt site being singularly unhelpful for checking the cheaper storage, I’m going to head over tomorrow and probably snag one of these for my bench-to-be. The 3 or 6 drawer chest should do just fine for reloading dies and basement tools. Well, Kobalt’s site only features their flagship products. The site’s limits are frustrating, but it’s better than nothing. Hopefully they’ll expand the site even if it means skimping out on the eye candy. I come up with $478 for the top-line setup on the left side of that add above from the local too. Bummer. Have fun with that new purchase! Consider posting some organizational eye candy in the flikr pool if you have a chance! I originally picked up the 12 in deep 6 drawer (274222) ($119) and the associated 3 drawer intermediate ($79). I uploaded some visuals. After seeing Andy’s comment about the 5 drawer 19 in deep chest, I have reconsidered and will swap today. The storage area is virtually the same, yet with taller/deeper drawers. The local store didn’t have it on display or even a sticker on an empty rack. I had to ask for a inventory lookup and sure enough they were hidding over the locks isle. I was checking out some Craftsman chests last weekend and found a severe misfeature: There’s a lip on each drawer face that reduces the usable depth of the adjacent drawer. Say the drawers are 3 inches apart and the floor is 1/8″ thick, you should be able to store a 2 7/8″ object in each drawer. But because of the lip (which I recall being about half an inch), the effective depth is only 2 3/8″. Numbers are examples only but I think you know what I mean. Sean, those are some nice photos, thanks for sharing! Do the sockets stay where they are when the drawers move? Nate, are you talking about the upper lip of the drawer faces? These “features” don’t really prohibit the storage of deep/tall tools. I mean, it’s okay of a tool is taller than the sides of the drawer. I’ve been thinking about it but cannot think of a good reason for its implementation either. Perhaps it’s to make extending and closing the drawer easier? the drawer slides are close to the top of the drawers for greater stability, so maybe there is some mechanical advantage to having the drawer pulls above the horizontal plane of the drawer pulls. Craftsman’s boxes also seem to have varying drawer heights. One of my intermediates (a Quiet Glide) has one very large bottom drawer maybe 4″, and two smaller ones. My ball bearing intermediate has two medium sized drawers, maybe 3″, and one smaller one. This is a photo of the drawer face. Is the highlighted feature that which you’re referring to? The included nonslip mats are a nice touch, but the sockets will roll with normal closure. I had actually purchased the Craftsman socket organizers but returned them. They waste too much space. I think I will go back with the clip rails to save space. I will upload pics of the 274213 box I swapped for earlier today as soon as I get it loaded up. Hmm… I wonder if a magneic mat wuld do any good. Maybe even adhesive magnetic strips? Since the drawers are steel, placing a few magentic strips underneath or in the drawer might help keep sockets in place. As for me, I have half my sockets in the original plastic organizer they came in, and the others on cheapo rails that hang from hooks. I think I may tryimplementing the magentic strip idea someday if I can find a good source for them. Or a cheaper/free alternative would be to wait until magentic fridge post-it pads run out of paper. I did some testing last night while loading up the new, bigger box. Standing the sockets on end, like in the flikr pix, worked for all except the smallest 1/4 drive sockets. They would tip over and get loose after a hard close or jolt against full extension. The remaining didn’t tip or slip. I am going to take a trip to the nearest Harbor F. (Clarksville, TN waiting on new Paducah, KY store in April) and check out their ITEM 37345-5VGA socket organizer. It appears to be less wastefull with its spacing from the pictures than the craftsman equivalent that I recently tried and will fit in the drawer of the bigger box without trimming it. Stuey, the bottom lip is the one I’m referring to. Without it, you’d be able to store taller stuff in the drawer below. Oh, okay. The bottom lip seems to be shaped like that for structural support and to aid attachment of the face to the drawer bottom. I’d say it’s about 1/4″ deep. This isn’t entirely a bad thing. If tools approached the next highest shelf by less than 1/4″, there’s a risk that they may hit it. I don’t think that precaution was factored into the design, but it’s almost definitely there for structural support. I would recommend http://www.zipcodesmapped.com/ for any US zip code map. You can use this to find any US zip code maps. You can search by (City, State OR Zip). they have all the maps showing zip codes and major mile streets in all of the united states. The service is free. Search for five Digit Zip Code and find the Maps for all 50 states. A Free ZIP Code Finder which can do wonders for you. Wow!! what a post! You gave the over all information about Tool Storage Cabinets.I came across one site.Here that site consists of more and more information about Tool storage cabinets.Have a nice day.